Hey, everyone! 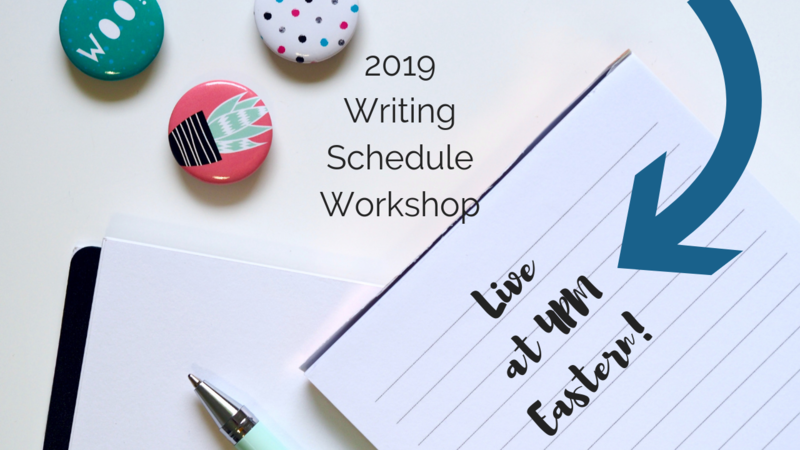 I wanted to let you know that today, December 8th, at 4PM Eastern Time, I’ll be going Live on YouTube for a 2019 Writing Schedule Workshop. Just for this live, I put together a special free workbook to help you figure out a realistic, powerful estimate of what you can get done in 2019. Sign up for my newsletter below to claim your free workbook! Get Your 2019 Writing Schedule Workbook! Subscribe to my newsletter and as a bonus, you’ll receive this 2019 Writing Schedule Workbook. **NOTE: If you are already on my list, I sent the workbook out to you already! Check your email! I am really excited for this live workshop, because for years, I way overestimated what I could accomplish. What that meant was that by January 10th, I was already way behind and spent my year feeling defeated, overwhelmed, and worthless. I watched the workshop. It was so helpful! I know you put a lot of time and effort into the presentation, and your viewers REALLY appreciate it! Thank you very much! I have just discovered you and have been so inspired. You are so positive, and talented! I have not written in over two years, having poured my creative energies into finishing grad school and then changing jobs. I am o looking forward to returning to this love of mine…and with your help I can only succeed! SO SO magical! I JUST wrote my Yearly writing schedule to prepare for when I get my contract so I can show my agent how prepared I am to write ONE book a year! Is this available as a word doc I can’t fill out a pdf. No, it isn’t available as a word doc, I’m sorry. It’s meant to be printed and filled out. My printer doesn’t work but I was able to figure out a way to use it digitally.